Stephanie got her start in local food by working for The Land Connection (TLC), a nonprofit focused on training new farmers and preserving farmland in Central Illinois. In over 2 years working there, she helped to establish and assistant manage the Champaign Farmers Market while acting as the office manager of TLC. In her time there, she had her hands in fundraising, event planning, communications outreach, and design. 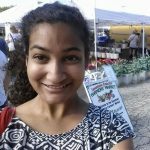 Since moving to Miami in 2016, she has been working with Farmers Market Coalition on various projects and campaigns as an Operations Assistant. Stephanie graduated from Illinois Wesleyan University with a B.A. in Writing and Philosophy. Stephanie can be reached at stephanie@farmersmarketcoalition.org, or (888) FMC-8177 ext 704.